After surviving an en route train change at Köln which left me bewildered and a little bit lost, I found myself safe and sound in David’s town—Heidelberg, Germany—for the initial part of the ADMU Chem-Europe Christmas reunion. 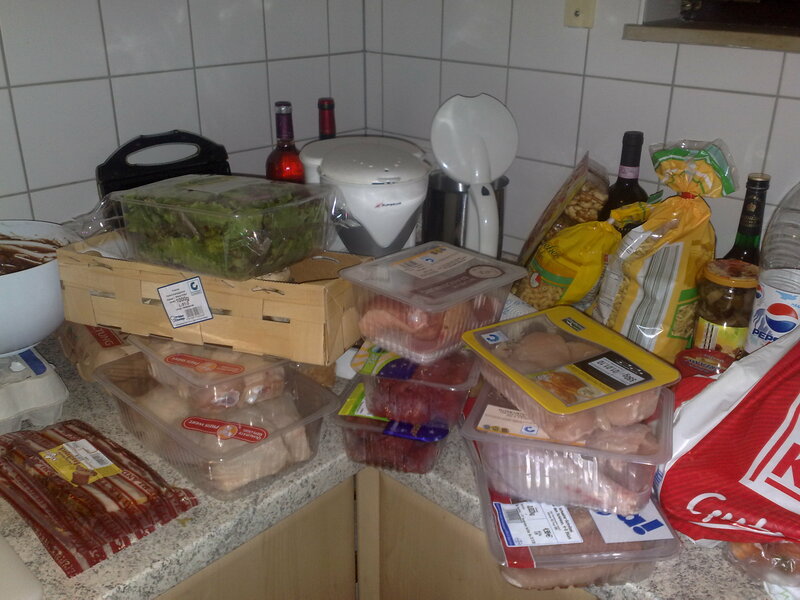 That evening, we went out and did the first slew of groceries in the nearby Kaufland for the Christmas Eve dinner (Noche Buena) and Christmas lunch. The subsequent grocery raids happened the next day (24th), which left David’s pantry literally overflowing with ingredients. The afternoon of the 24th found us back at David’s residence, cooking (I’m proud to say that it has been a privilege to be his sous chef, because I learned a LOT). 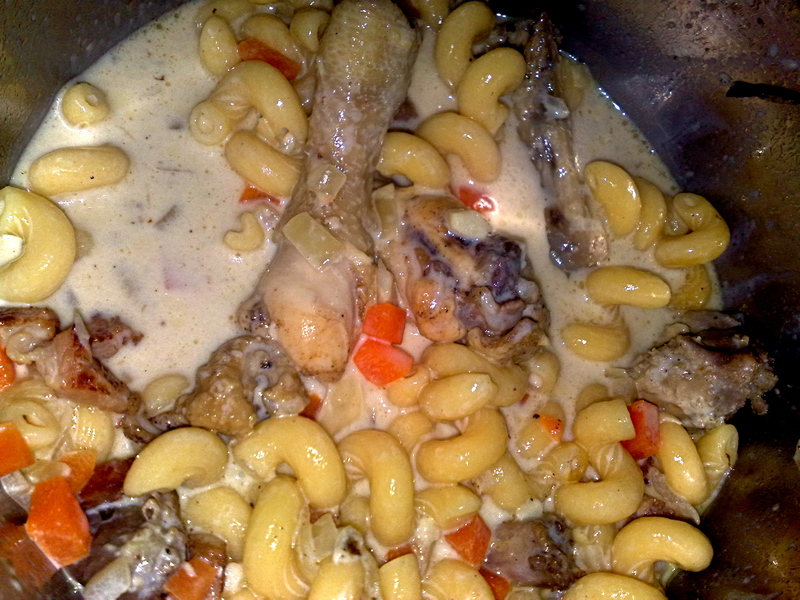 Not just for the Noche Buena, but also for the Christmas lunch (see David’s post)—bouef bourgignon and mushroom bourgignon (for the lunch party), and creamy chicken sopas and David’s version of German fiesta ham. The creamy chicken sopas. Sopas is a colloquial Filipino term (derived from Spanish) for a noodle soup dish. In this case, the generous amount of milk used in this dish and the slow simmering brought out the full flavor of this comfort food. We were delighted to taste its sweetness despite the obvious lack of added sugar. Amazing. Sweat bacon. Add olive oil, garlic and onions. Let onions caramelize. Saute chicken pieces. Add diced veggies. Add chicken stock and milk. Bring to a boil and simmer at low heat for at least 30 minutes. Add macaroni. Once the macaroni is cooked, remove pot from heat. Keep warm or serve immediately. Glazed (German) Fiesta ham. No, David did not make fiesta ham from scratch—he bought a 2-EUR bone-in ham from a Kaufland and a can of pineapple slices in light syrup. Preparation was pretty much straightforward: line aluminum pan with pineapple slices, place ham on top, stick in oven until the ham is nicely browned. 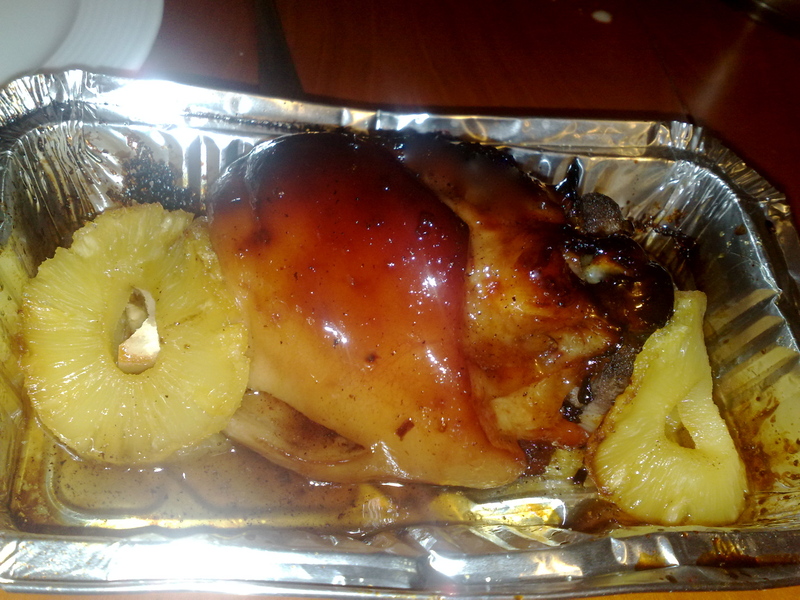 The glaze was prepared from the canned fruit’s light syrup with a bit of sugar. Those two simple dishes, served with baguette rolls and Boursin (really good cheese…must grab some when I’m back in Leuven after the holidays), brought what we really missed that Christmas Eve—the memory of Christmas at home with family. Coupled with bantering, jokes and good conversation, our first Heidelberg Christmas still had a Filipino heart. 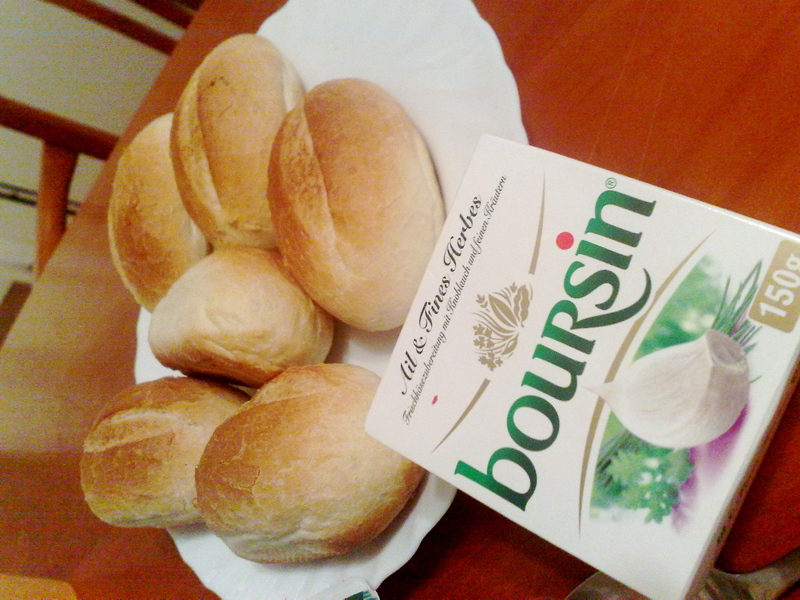 hahaha sharing the love of Boursin!